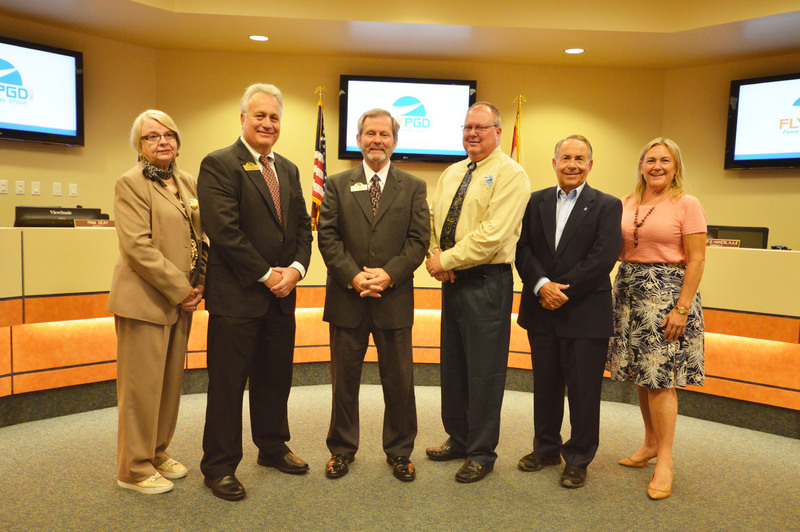 The Charlotte County Airport Authority has five commissioners elected at large by the citizens of Charlotte County; one from each of the five districts of the county, each serving four-year terms. The Airport Authority is an independent special district pursuant to chapter 189, Florida Statutes, and operates in accordance with FAA requirements and guidelines. Chapter 2011-263 and 2013-254 of the Florida State Statutes contain the full text of the enabling legislation for the Charlotte County Airport Authority, an independent special district with no taxing authority. The Airport Authority Board meets monthly generally on the third Thursday of the month at 9:00 a.m. Special meetings are publicly advertised. All meetings are conducted in accordance with the Government in the Sunshine Act. The Airport Authority operates as an enterprise fund, totally supported by revenue generated from their operations such as rental car concession revenue, parking, fuel sales, hangar leases, building and land leases. The Airport Authority collects no ad valorem (property) taxes, therefore no local tax money is used in airport operations or expansion. The Charlotte County Airport Authority exercises authority over the 1,800-acre boundary of the Punta Gorda Airport. The airfield consists of three runways with the longest at 7,195 feet in length, and a 135’ Air Traffic Control Tower on the field. There are 217 T-hangars on the field and many aviation and non-aviation related businesses nearby. The Charlotte County Airport Authority has adopted a Code of Ethics as part of the Charlotte County Airport Authority Personnel Policies and Procedures Manual. Other generally applicable ethics previsions also apply. See www.ethics.state.fl.us (select Ethics Laws). Learn more about Public Records Requests and the history of the Punta Gorda Airport. An avionics shop, flight schools, pilot shop, airframe and engine repair facilities, air charter and air ambulance are all located at the Punta Gorda Airport.